I was inspired by the snow to make these the other day. It's a winter wonderland around here. When the snow first comes in November and December I'm always okay with it. It's pretty, fun to play in, etc. By February I am so done with it. So if any of you live in a warm climate and would like to adopt me, please let me know. But really, I'd much rather have 3 feet of coconut macaroons laying outside instead of snow. 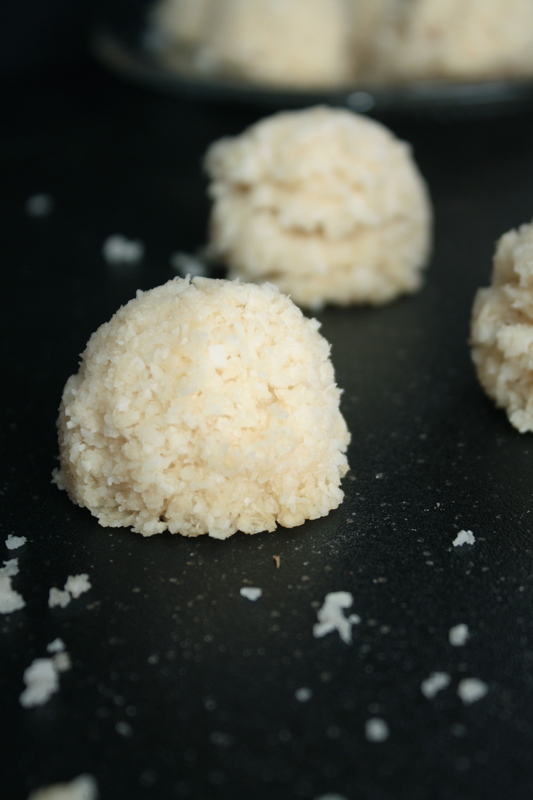 Think of all the possibilities if it snowed these little balls of coconut goodness instead of actual snow. Wow. Now that's all I'm thinking about as I look outside to see plain old snow falling from the sky with no sign of stopping anytime soon. I think it's against me creating new recipes because I'm running quite low on supplies. Ah, no worries though, I will be braving the weather to go get groceries this afternoon so that I can make all kinds of awesome desserts (and other stuff) to share with all of you! You will have these gone before they're removed from the dehydrator. At least that's how it went for me. Twice. The third time was a charm though and I resisted shoveling (snow/shoveling; ha ha perfect) them all into my mouth before snapping a few pictures. These coconut macaroons are sweet and airy. Each bite leaves little crumbles of soft and sweet coconut exploding onto your taste buds; making you run out into the snow to make snow angels of happiness. Okay, maybe you won't run out into the snow. But I'm pretty sure that you'll feel like doing something of that sort after popping a few of these little guys into your mouth. Combine first four ingredients together in a blender. Blend until ingredients soften and create a semi smooth mixture; like a chunky coconut butter consistency. Add in remaining two ingredients and mix well. Spoon out macaroons onto dehydrator sheet/parchment paper and dehydrate at 110 degrees F for 5 hours. Remove from dehydrator. Serve, enjoy! If you don't have a dehydrator you can make these in your oven. Set oven to lowest degree and bake on parchment paper.